That crumb looks pretty good to me. I can understand your frustration with the yolk/flour lumps. I suspect that by substituting all yolks in place of whole eggs you effectively increased the amount of fat and decreased the amount of water in the bread. You may want to hold off with the other changes until after you've made it again following the recipe. The other flavors may come through more clearly when whole eggs are used and not require boosting. that's a good point. The egg yolk was pretty dominatint. I barely tasted the mild sourdough tang. Really good effort. The crumb looks great! I see you managed to hold of the moulds then! I don't know if you saw it, but I made my version again recently (it's not sourdough). I dressed it up and made some pandoro sugar to go with it. I see that you increased the amount of flavor elements in yours this time around (honey, cocoa butter, etc). Did you have to adjust any other quantities accordingly? I made it exactly as the posted recipe. I felt I needed to add more flavour. The dough was very slack but still manageable. I think I was taking the flour to its limits though. Those look great to me! I've been eyeing that recipe and wanting to make it, it's very helpful to hear of your experiences. I was also hoping to produce the light, billowy strands of bread that you describe, had it once and have been wanting it again ever since. They are still great though, and by all means delicious, especiaaly when dipped in Santos wine! 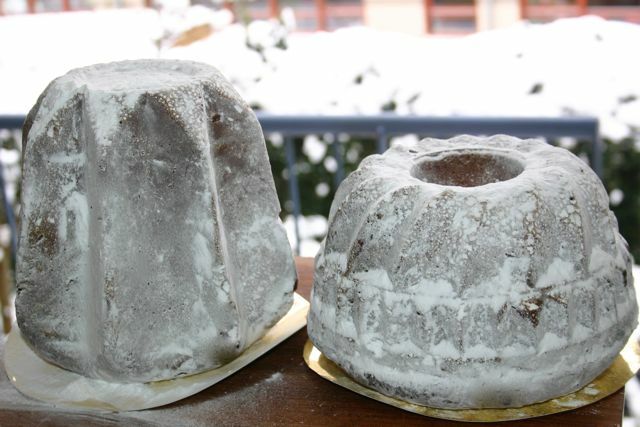 I agree that the pandoro I've tried is not the same as the pandoro that exists in my head. My mission is to (someday, hopefully) bring the imaginary pandoro into reality. By the way, I'm really enjoying your Bread Lab videos. Keep them coming! Congratulations on such good baking! Your pandoro looks great and, at least, in my opinion, your crumb's texture is VERY good. In order to have long shreddable strands in pandoro, it is helpful to use the very strong flour, and mix the yolks into the dough one by one, adding at the same time sugar. That the technique used by Adriano Continisio in his famous blog about Italian breads and brioches "Profumo di lievito". thanks for the tip! I used King Arthur's Sir Lancelot flour (14% protein), but I definitely rushed the addition of the yolks and sugar - I dumped about a half cup worth of yolks in at a time.